Pi is a character in the roman alphabet ( π ). In mathematics it is used to represent the ratio of a circle's circumference to it's diameter ( C / d ). The fraction that results from dividing a circles's circumference by its diameter has infinite decimal places, making it an irrational number. It simply goes on forever and ever. Literally trillions of digits of pi have been calculated. 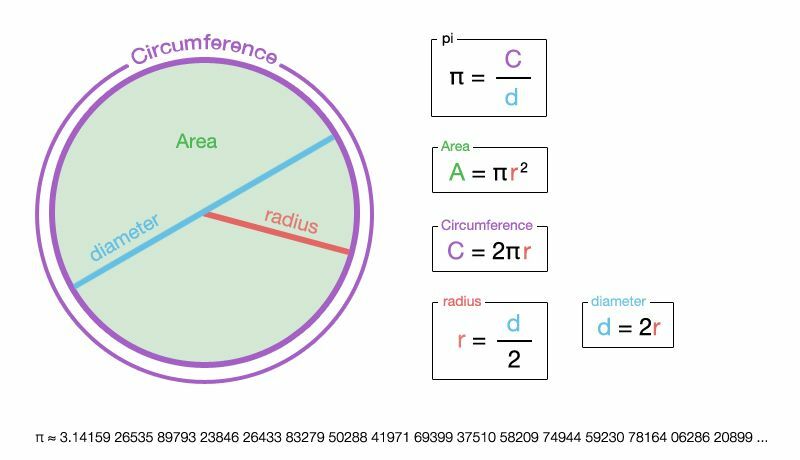 The most common use of pi is to calculate a circle's area, using its radius (half the circle's diameter), with the formula: a circle's area equals pi times the radius squared ( A = π r ^2 ). And to calculate a circle's circumference with the formula: a circle's circumference equals two times pi times the radius ( C = 2 π r ). The mathematical concept of pi has been used in ancient civilizations since the 5th century.